Posted on June 16, 2010	by Lou Murray, Ph.D. The hens are molting and taking dust baths. They’re so much fun to watch. It’s another gorgeous day in paradise here in Huntington Beach–sunny skies, with temps in the high 70s. 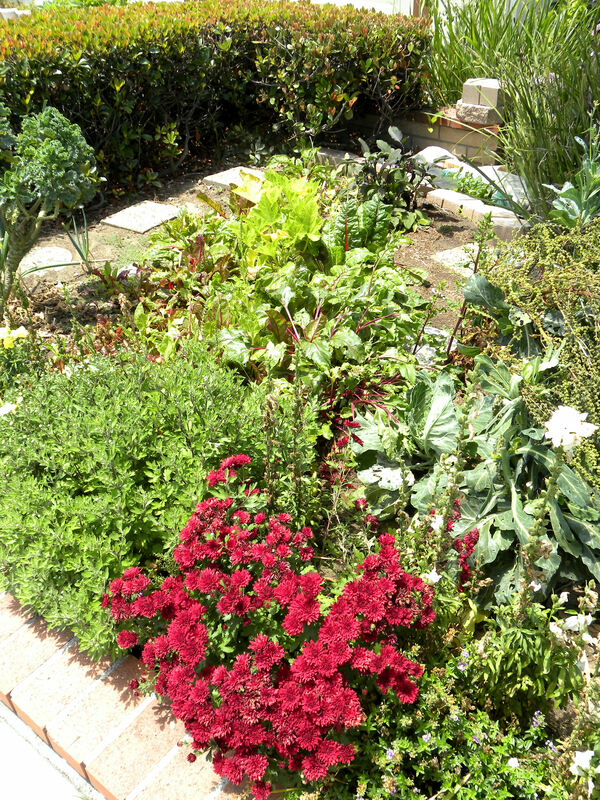 My garden is booming and blooming along, with some things newly planted and some things ready to harvest. Here’s a peek. 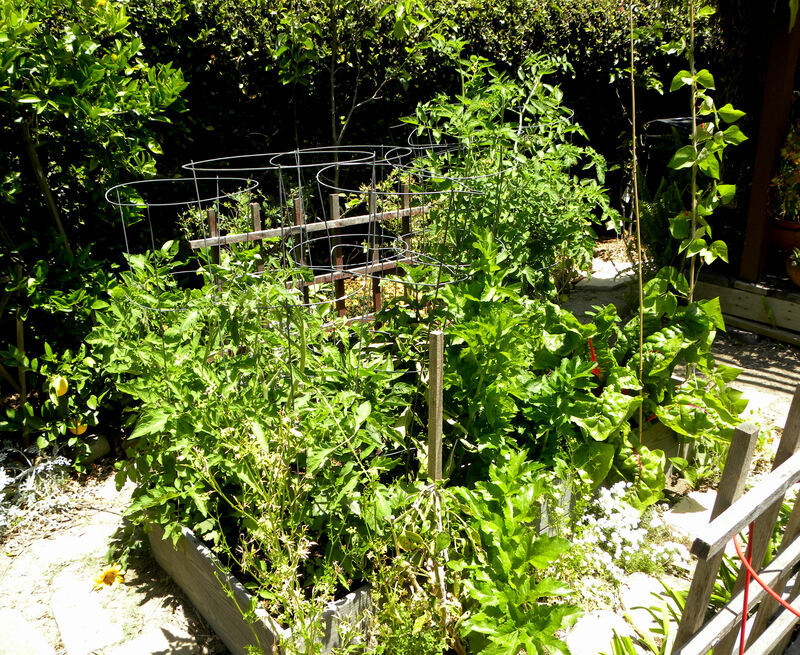 Raised bed #1 has tomatoes, bell peppers, yellow squash, chard, a couple of parsnips and a carrot. Yep. A single carrot. Raised bed #1 looking from a different angle. 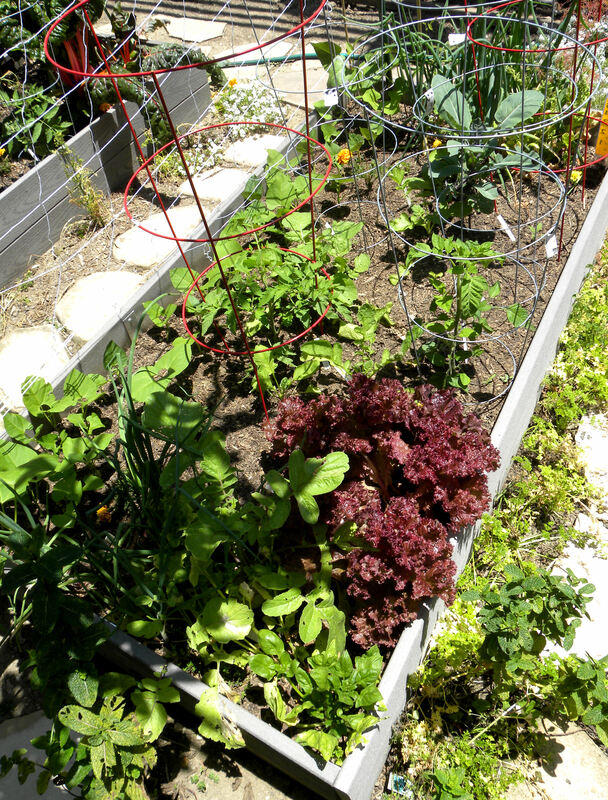 Raised bed #2 has chard, tomatoes, cabbage, leeks, eggplant and some miserable Snow Wind peas that are past their prime and need to come out. 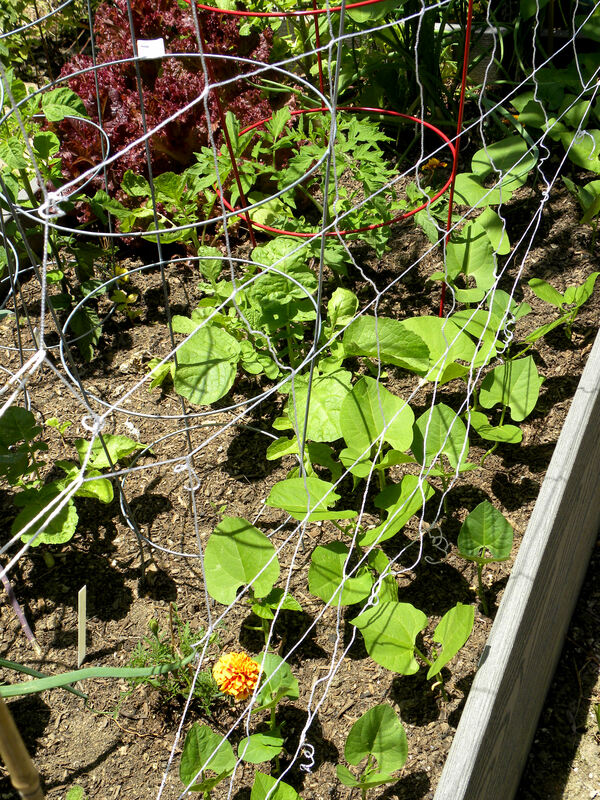 Raised bed #3 has tomatoes, radishes, Blue Lake pole green beans, a few Scarlet Runner beans, onions, lettuce, a lanky purple cauliflower that shows no signs of making a head, and some spinach that needs to go to the chickens. Raised bed #3 from a different angle. 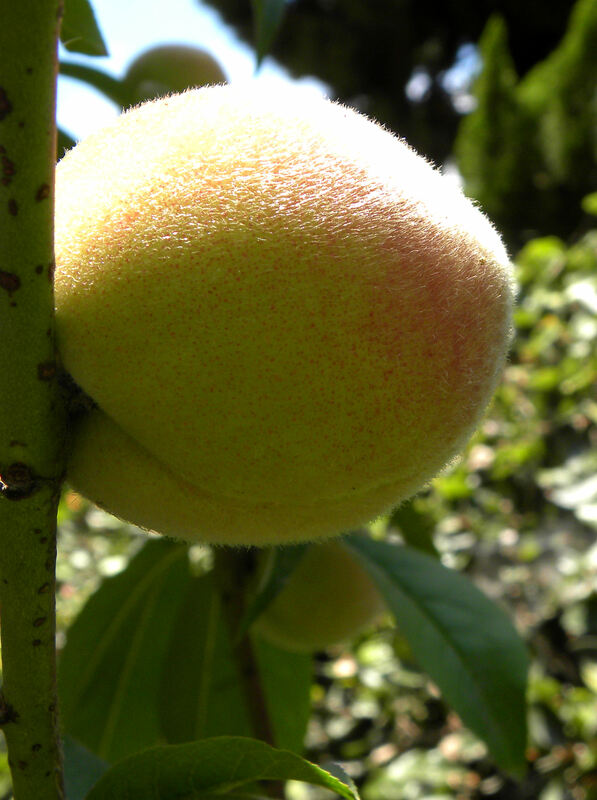 The Babcock Improved Peaches are beginning to blush. I wonder what is embarassing them. 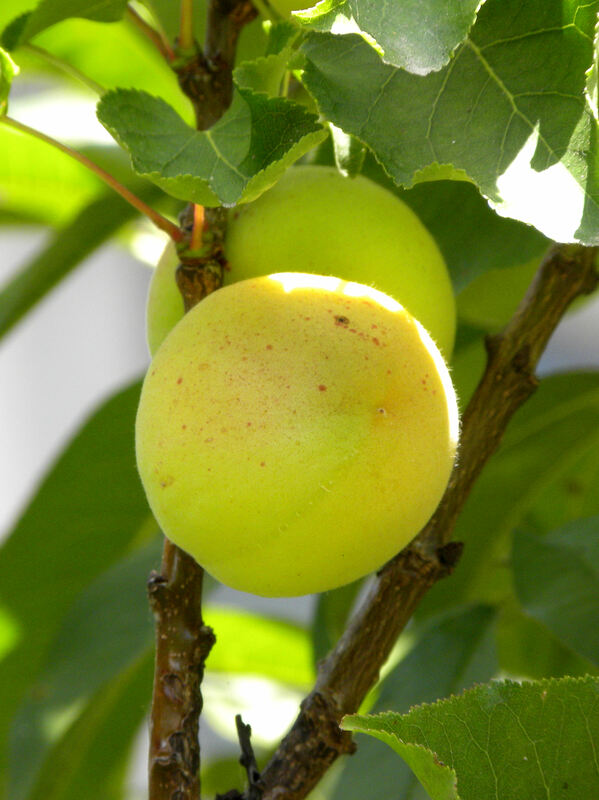 The Katy Apricot has only three apricots on the tree, but they're big ones. Looks like they'll be ready soon. 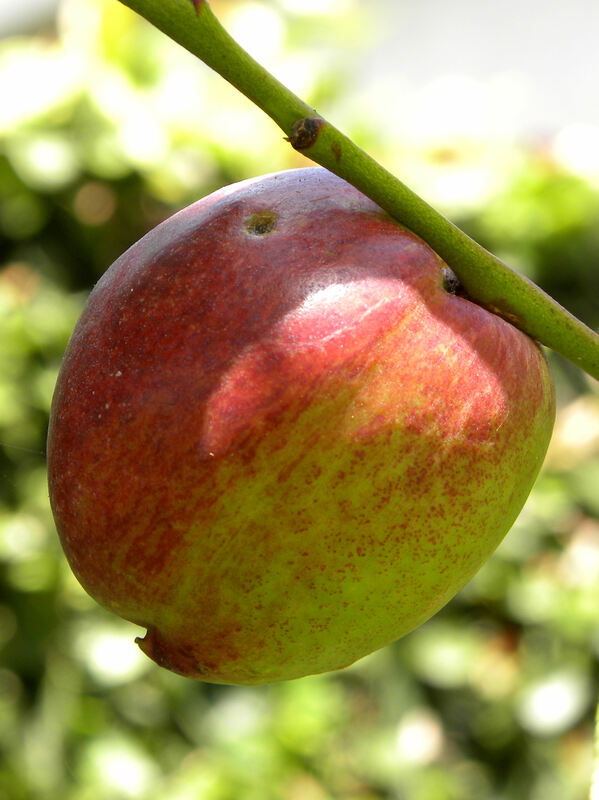 The Panamint Nectarine tree is loaded with fruit this year. I can hardly wait. The Snow Queen Nectarine is a young tree and only has a couple of nectarines on it, but they look really good. Betcha they look good to the squirrels, possums, raccoons, etc. too. 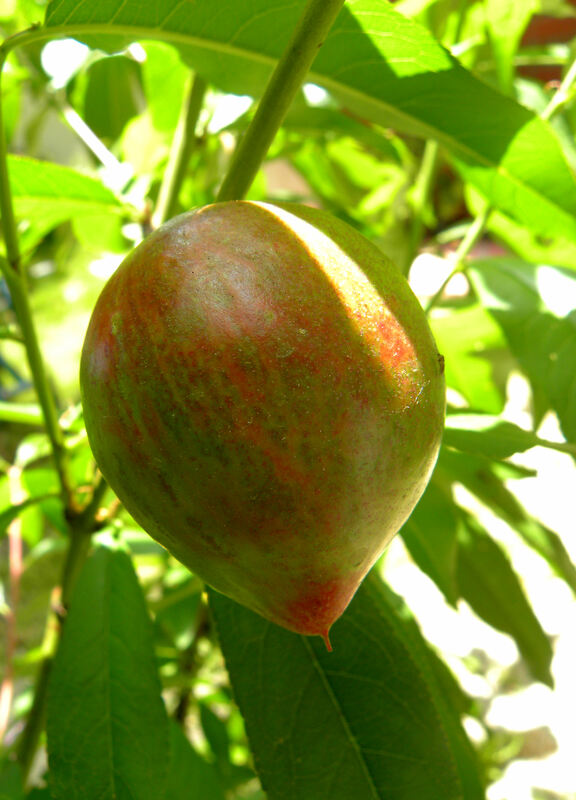 Who will get this lovely fruit? 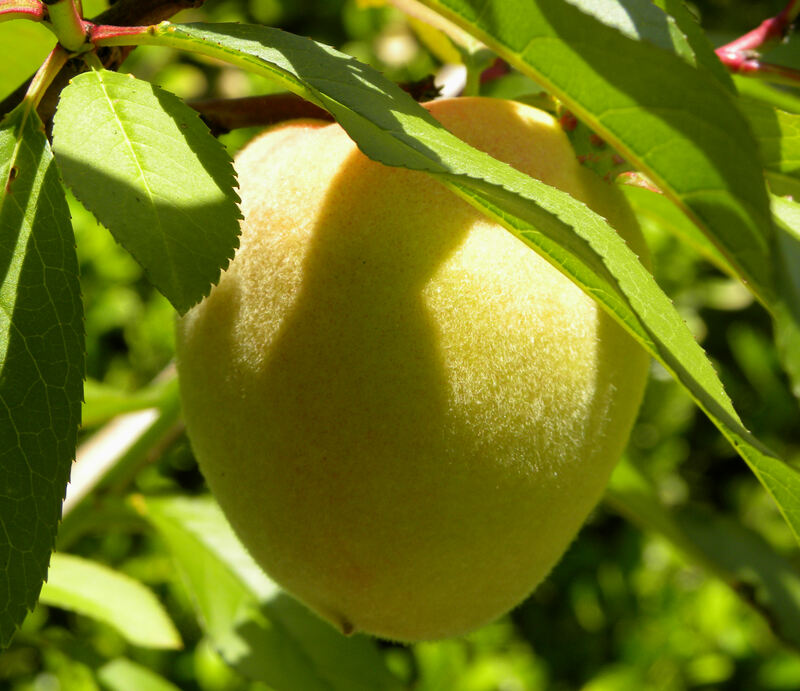 This is the only peach on the August Pride peach tree, another young tree. 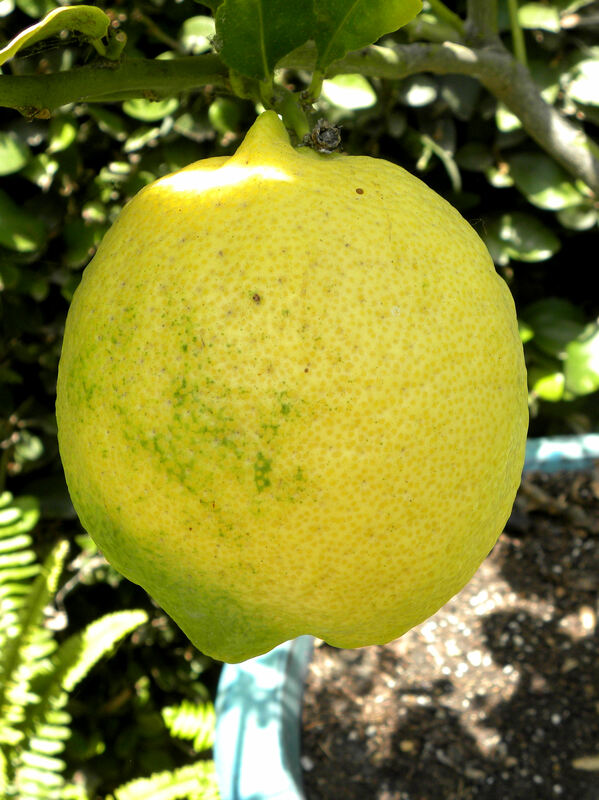 This is the last ripe Eureka Lemon left on the tree. 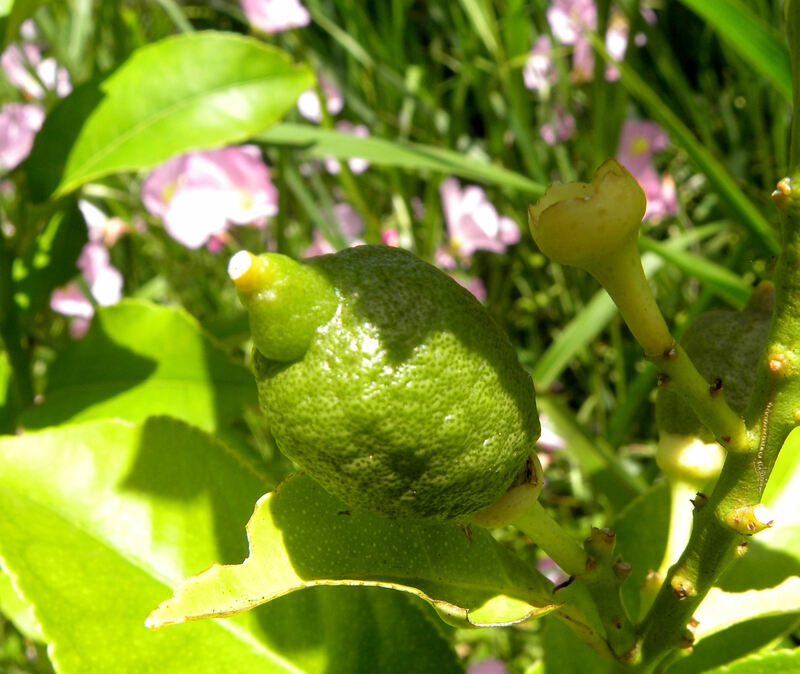 But my other two dwarf Eureka lemon trees have set fruit. 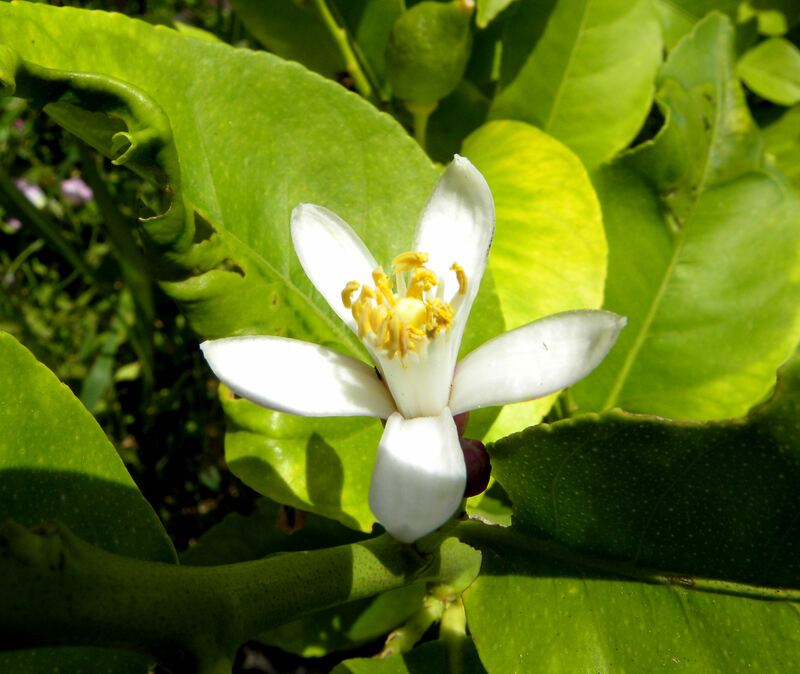 And the Eureka lemon trees are still blooming. What a lovely smell. I have three Valencia oranges that I'm saving for a special occasion. I'd better come up with that occasion pretty soon because they won't last forever. 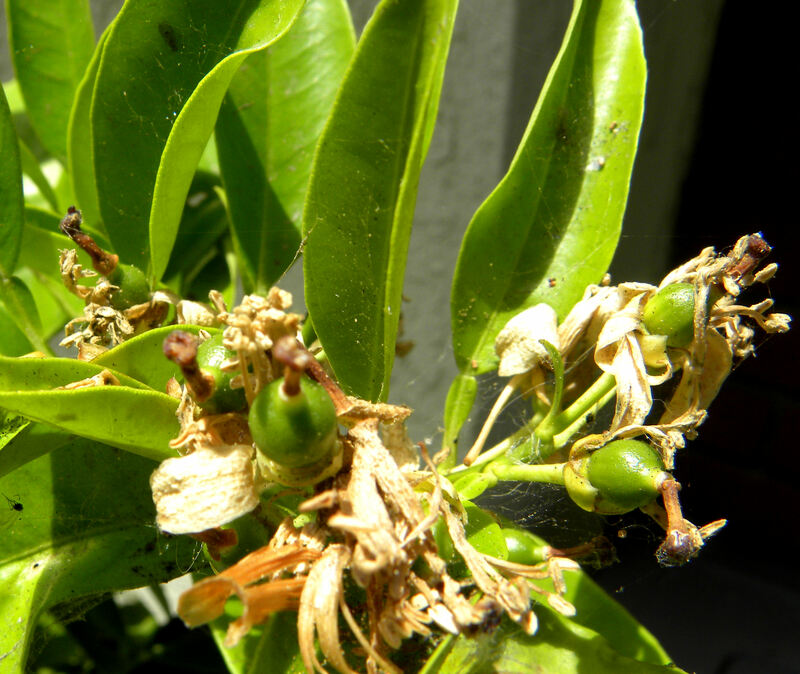 Next year's crop has already set on the Valencia orange. 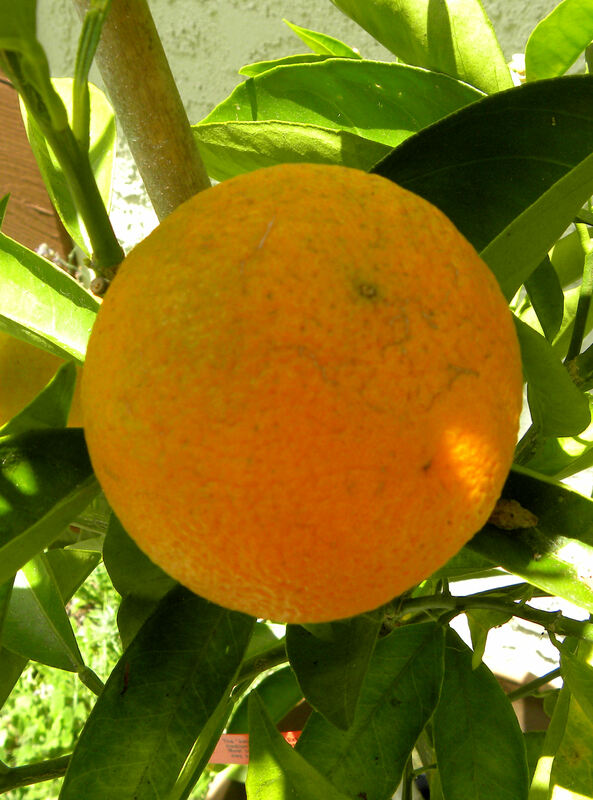 Ditto the navel orange, but I didn't photograph that tree. 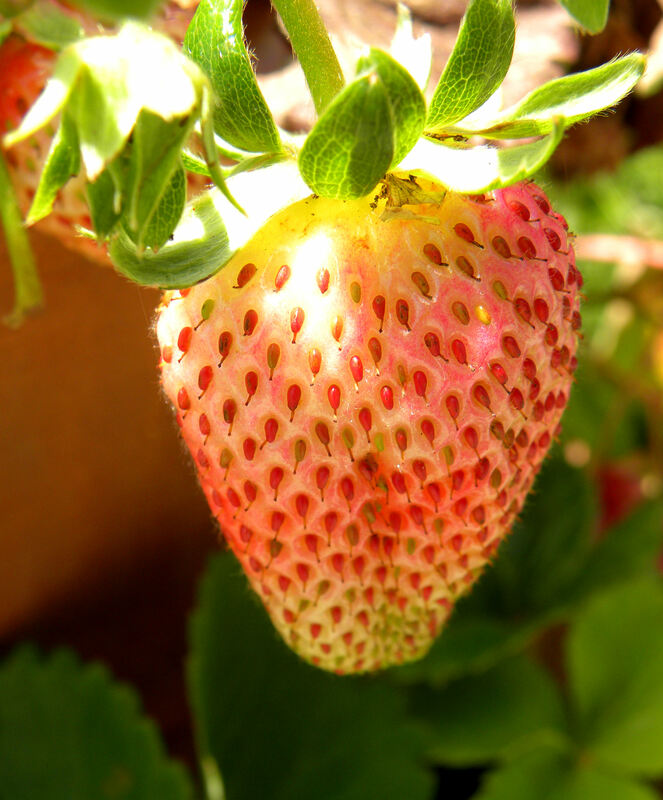 The strawberry harvest seems to have peaked, but I'm still getting a berry or two. I ate all of the ripe blueberries before I got my camera out, so I'll move on to apples. 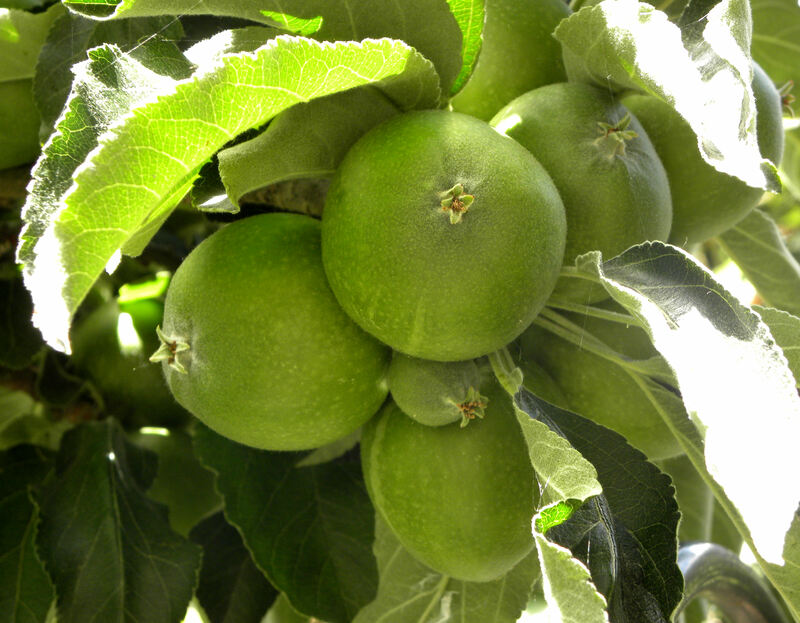 Looks like it's going to be a good year for the Granny Smith apple tree with about three dozen apples set. 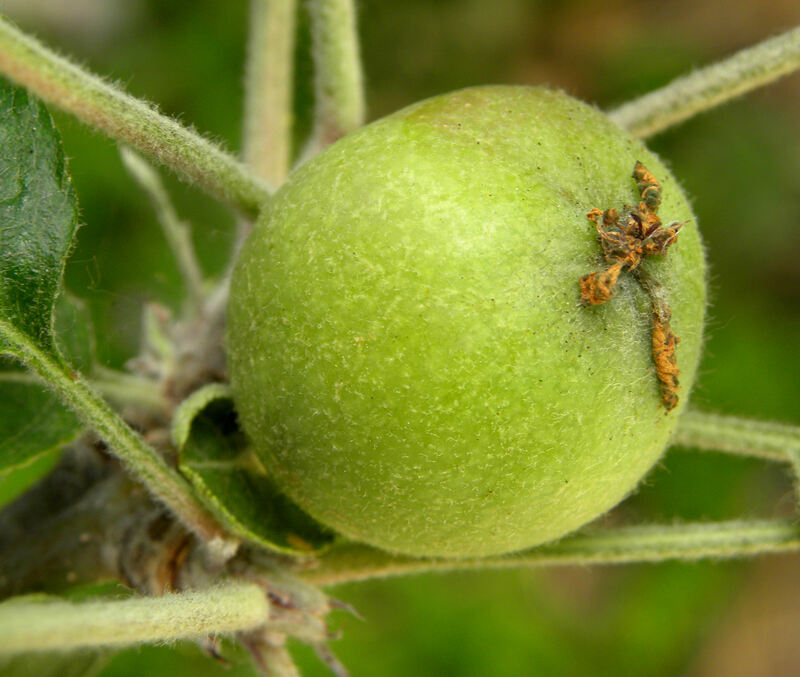 Our semi-dwarf Fuji apple is still a baby, so we have only three apples on it. None on the Gala, which is a full-sized young tree. 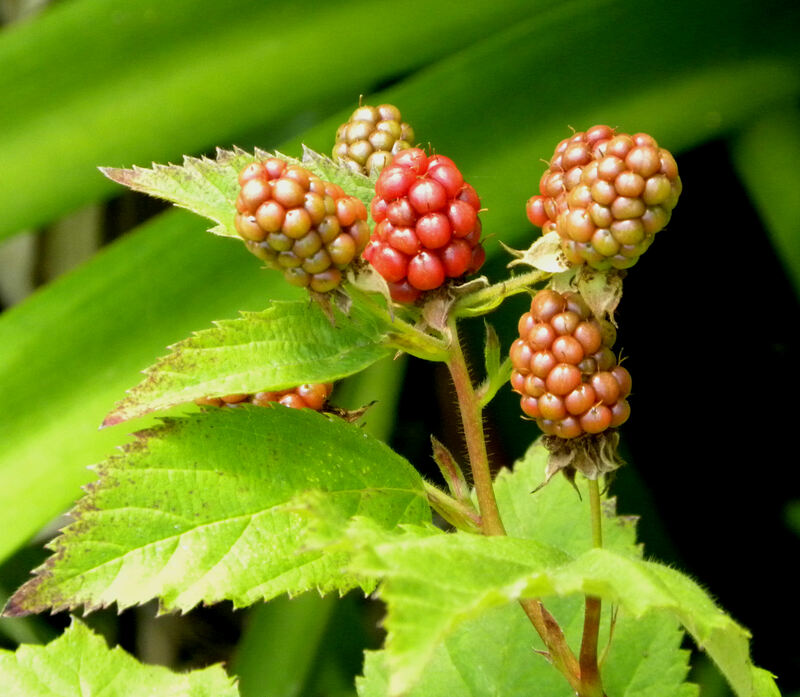 The blackberries still aren't ripe. 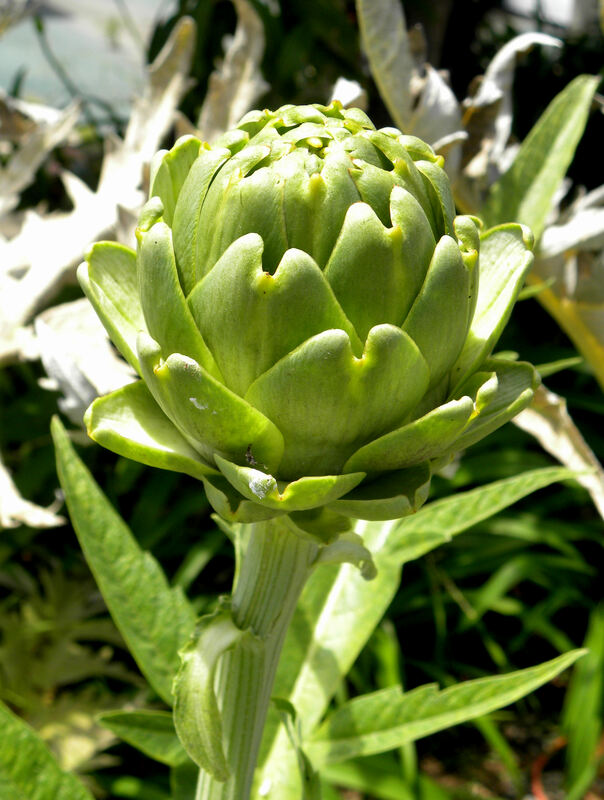 Looks like I have two more artichokes to harvest and then that crop will be finished. 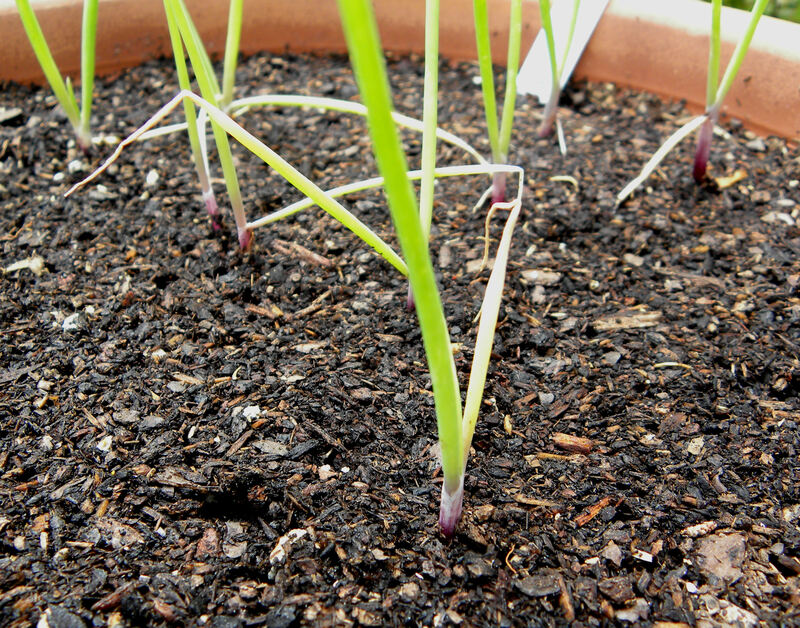 My red and yellow onions are starting to bulb up. I hear that they form bulbs about three weeks after the summer solstice. 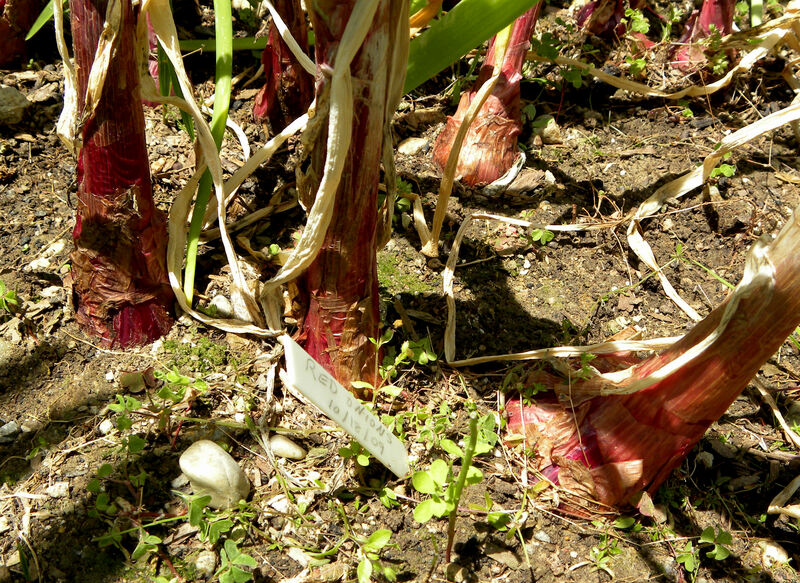 My Red of Florence bunching onions are still tiny, but their bulbs are already red. This is a new variety for me so I can hardly wait until they're ready to eat. This is my first cucumber of the season, a Tendergreen. It has a long way to go before its ready to eat. I like my Smart Pots so much, that I got two more. 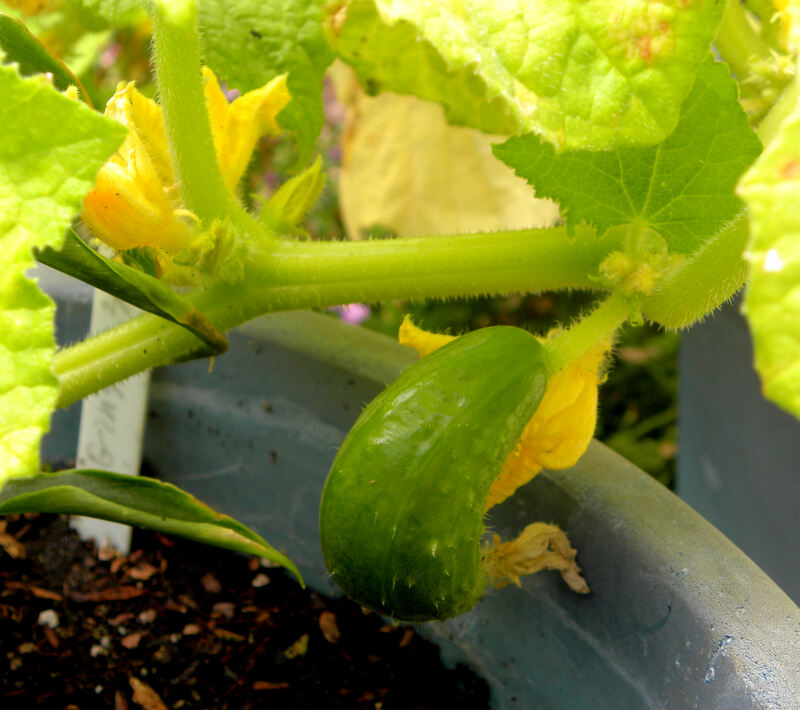 I'm growing winter squash, eggplant, sweet potatoes, German Butterball potatoes and sunchokes in them. I need a bigger pot! These winter squash (mini Red Kuri, mini Green Kuri, and mini Blue Hubbard) are only 13 days old. 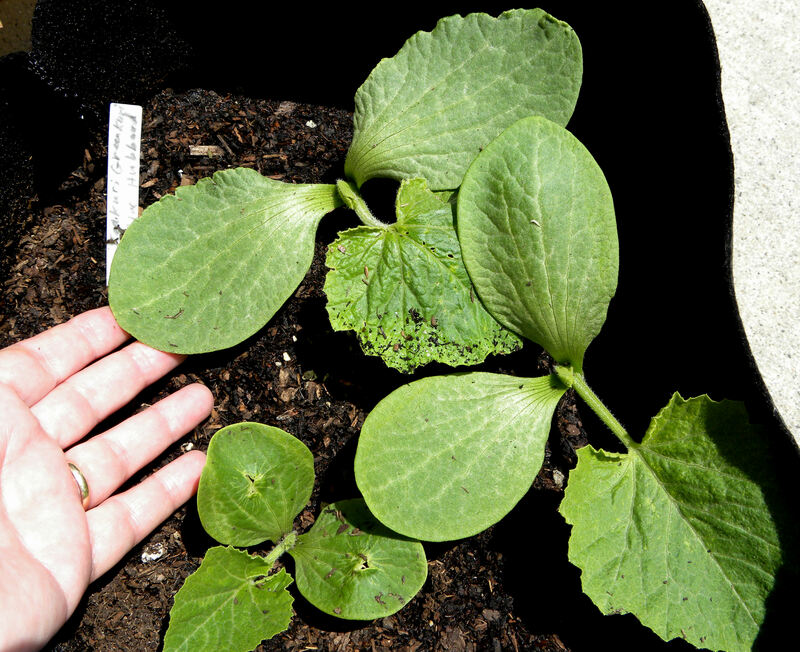 Check out the size of those cotyledon leaves. Righteous Bovine! My first attempt at growing sweet potatoes is going well so far. As soon as the Peruvian Purple potatoes came out, I added more fertilizer to the pot and planted some German Butterball potatoes. So far, so good. 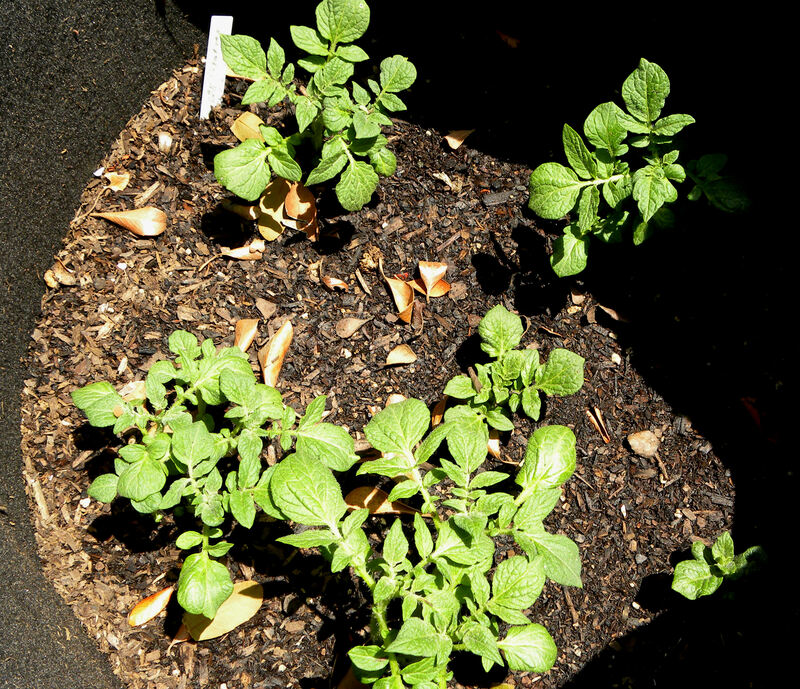 I'll add more potting soil to the pot as they grow to encourage layers of potatoes to form. 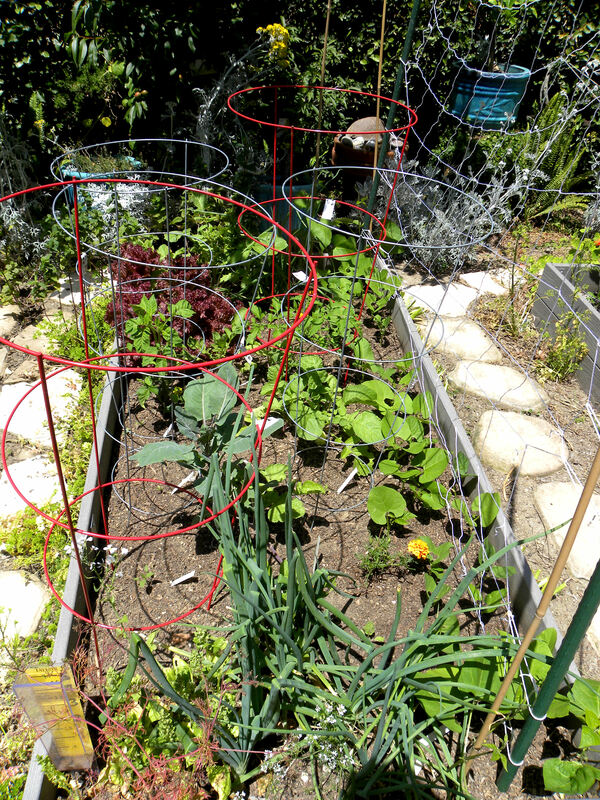 The Garden of Infinite Neglect has patty pan squash, Millionaire eggplant, Scotch Blue Curled and Lacinato kale, collards, Golden and Lutz Greenleaf beets, Kyoto carrots, loosehead Chinese cabbage, lots of chard, and a row of flowers. I'm already harvesting Early Girl tomatoes. 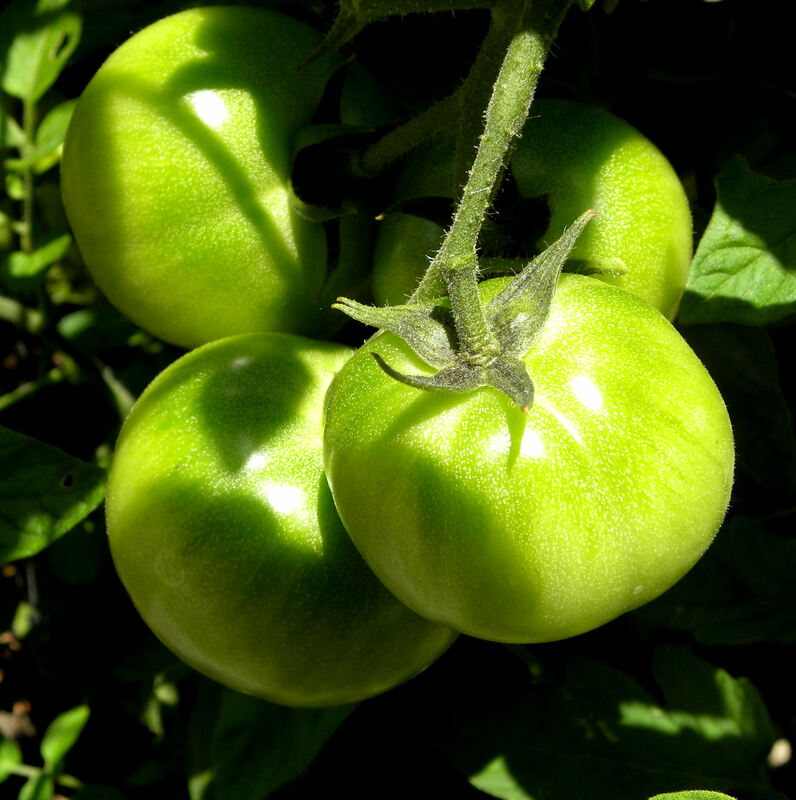 These are Celebrity Tomatoes. 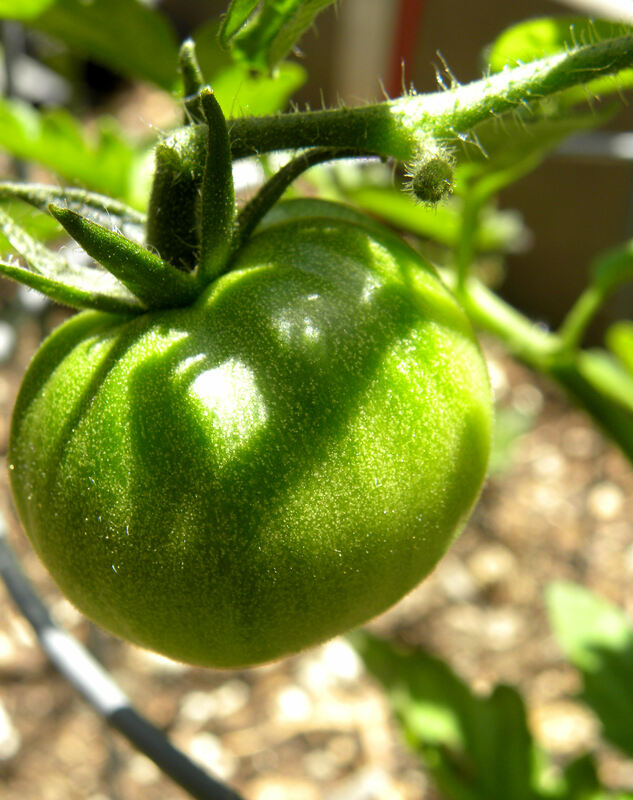 My first Black Krim has set on a tomato plant that I grew from seed. This is my first attempt at growing Komatsuna, a Japanese mustard green. 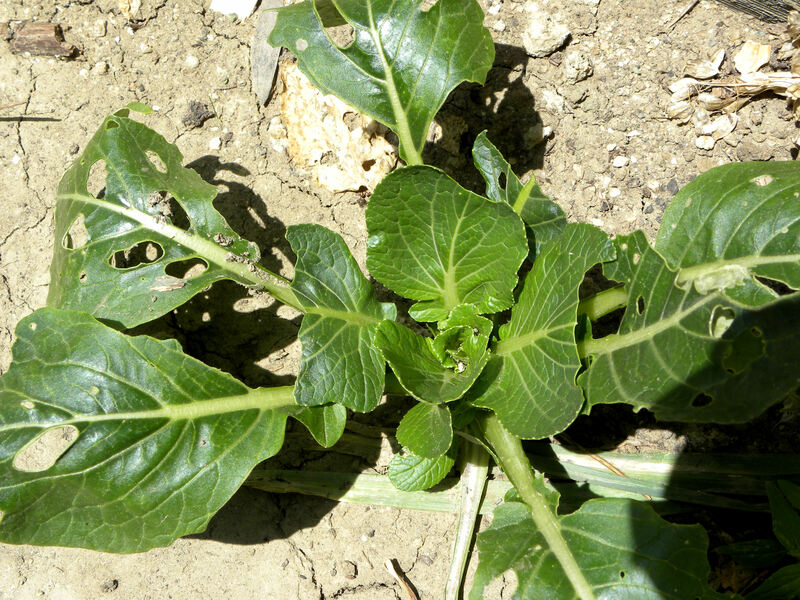 A cabbage worm got part of it, but once I dispatched the worm, the plant recovered. 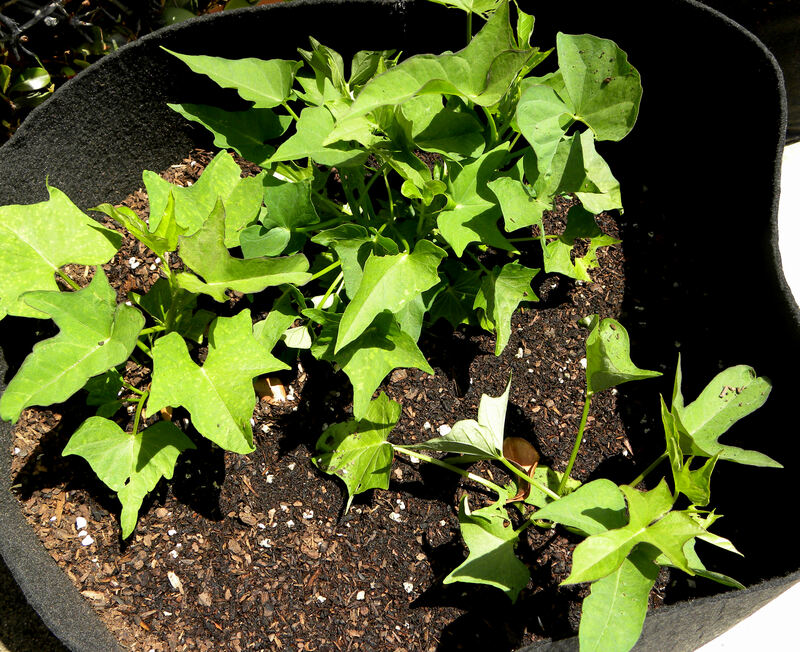 These are the Blue Lake pole beans that I replanted after the raccoon dug them up. They don't seem much worse for the experience. 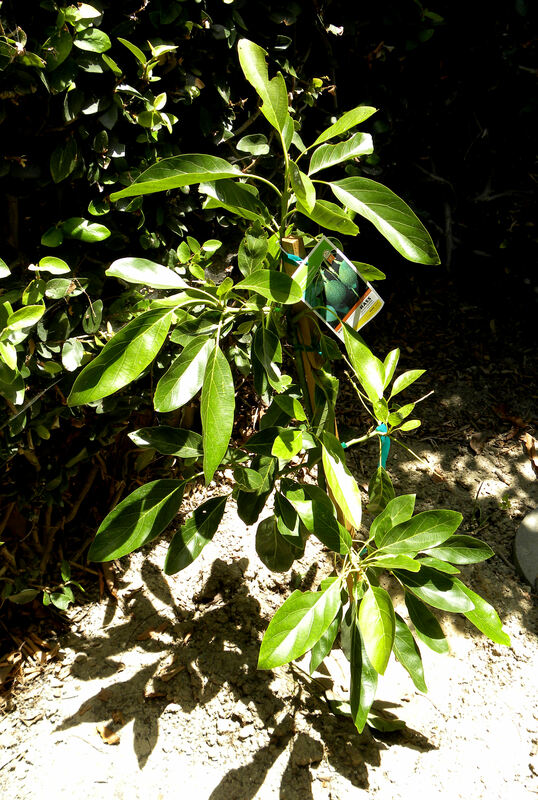 This is my newest tree, a Haas avocado. All of the fruit that had set fell off. Maybe next year. 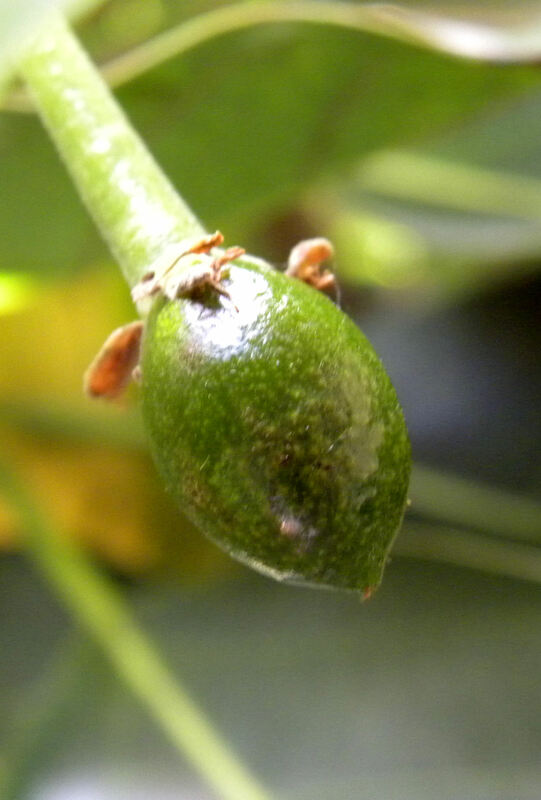 I had 6-7 fruit set on the Littlecado tree, but the only avocado left is this one. It may fall off too as it's pretty small. If this tree doesn't produce any avocados next year with the Haas next to it to fertilize it, I'm going to cut it down. I never promised you a rose garden, but here it is. 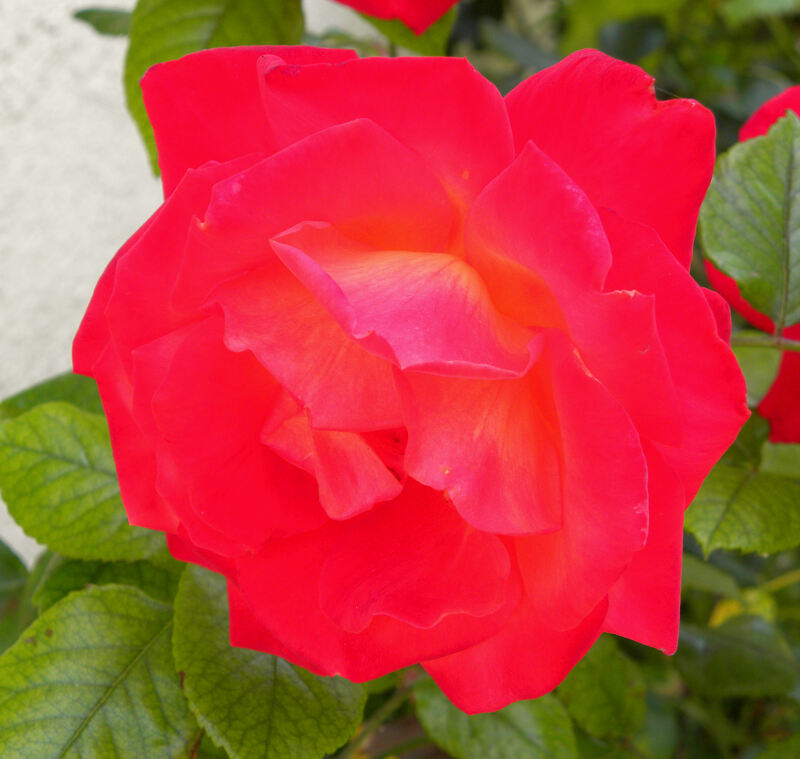 I love the color of this rose. It's my best bloomer. Can't remember its name. My iris bed in back is pretty new. 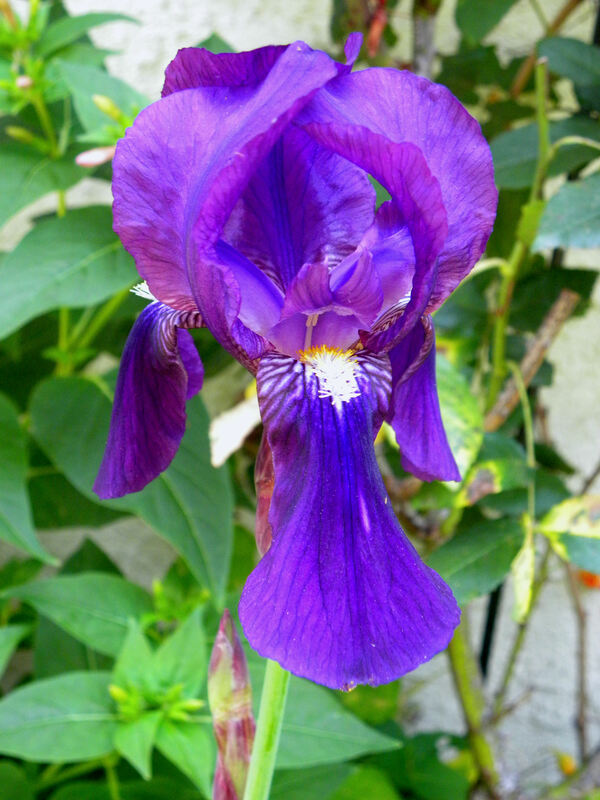 This is the first bloom on my Grandma's Purple Flag, an old time iris. 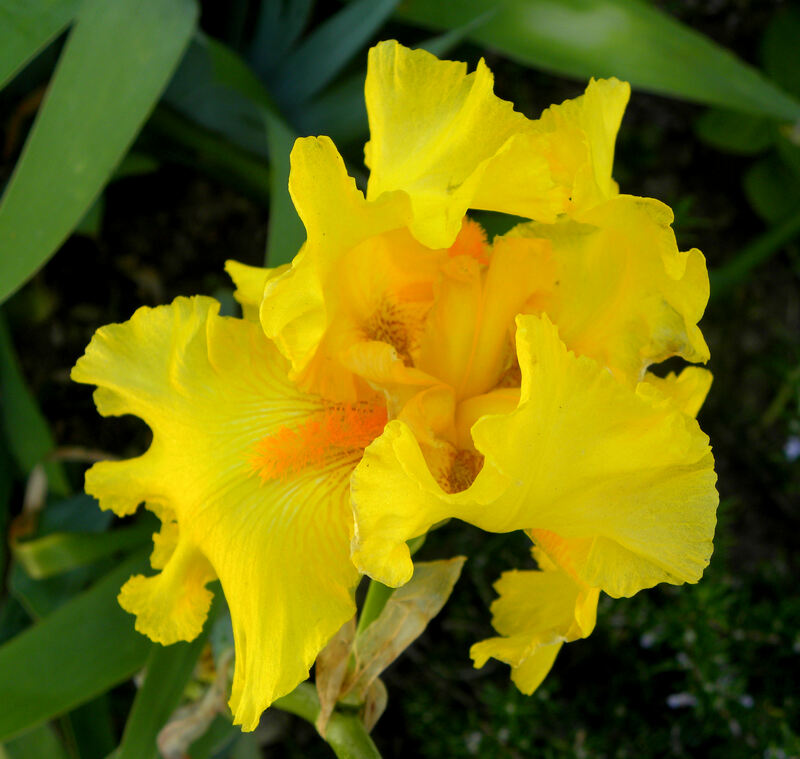 These yellow iris have been in the ground for several years and are reliable bloomers. 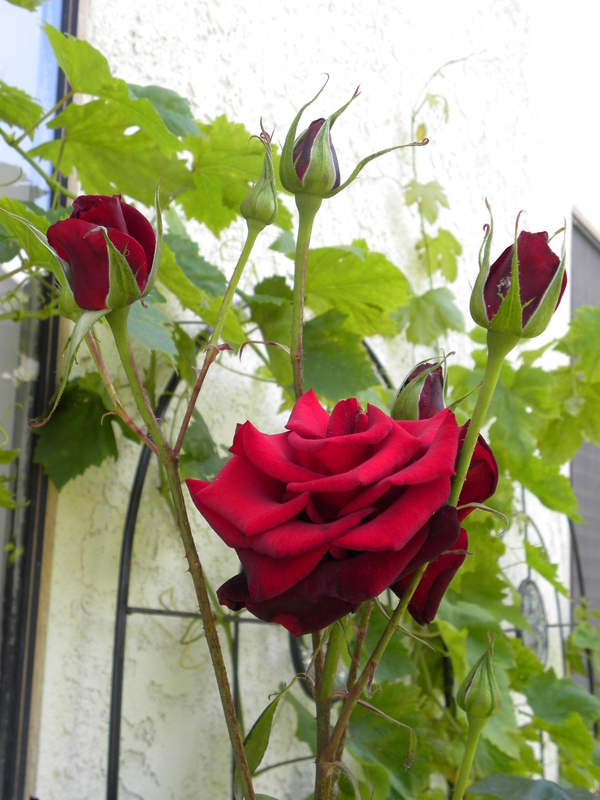 The other four varieties did not deign to bloom for me this year. Or last year. Maybe next year. 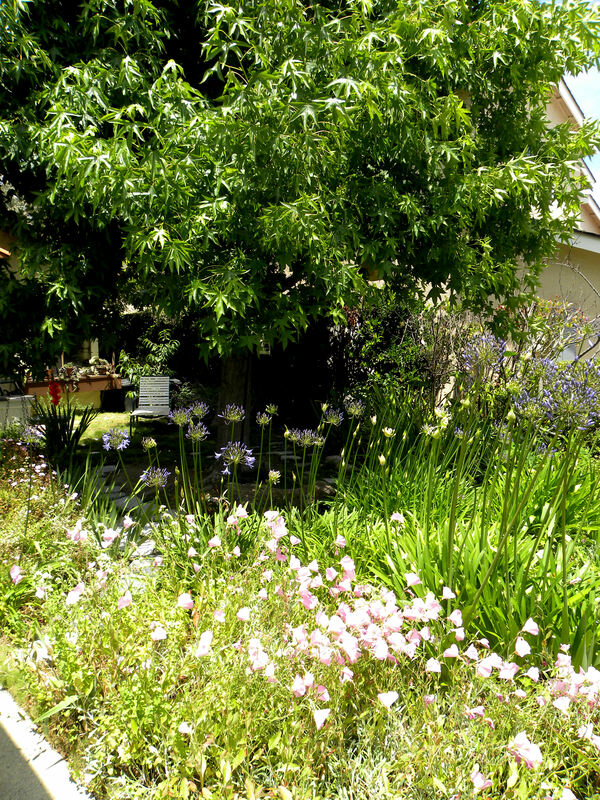 Most of the front yard is heavily shaded by the two liquid amber trees, but the pink Mexican poppies and blue Lilly of the Nile bloom in June, along with Scabiosa, chrysanthemums, lavender, oregano and marjoram. 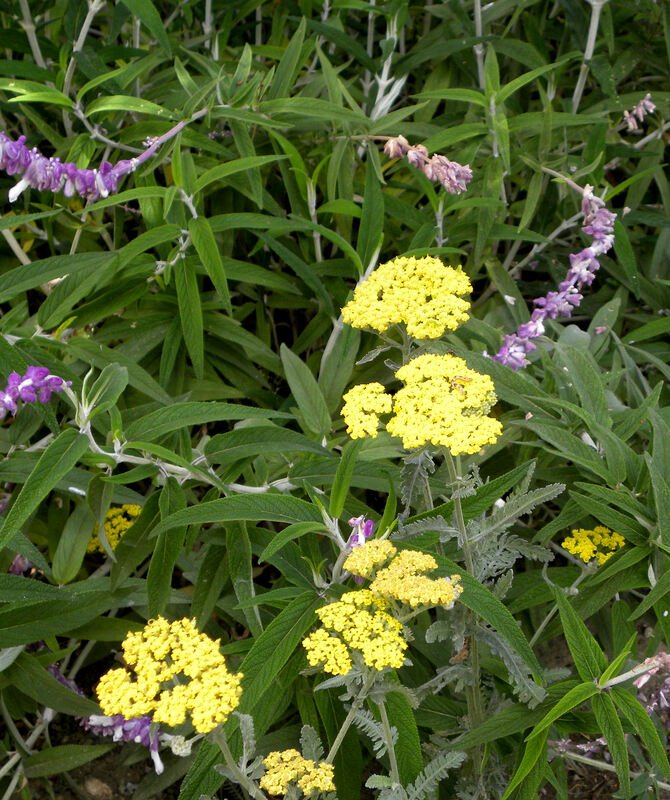 My butterfly garden has golden yarrow and Mexican sage in it. 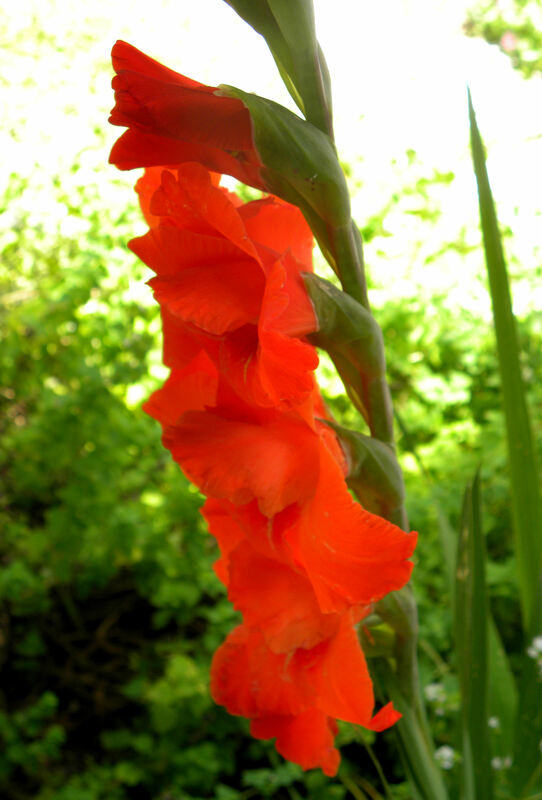 I never got around to planting my gladiolus bulbs this year. This one is a resprout from last year. 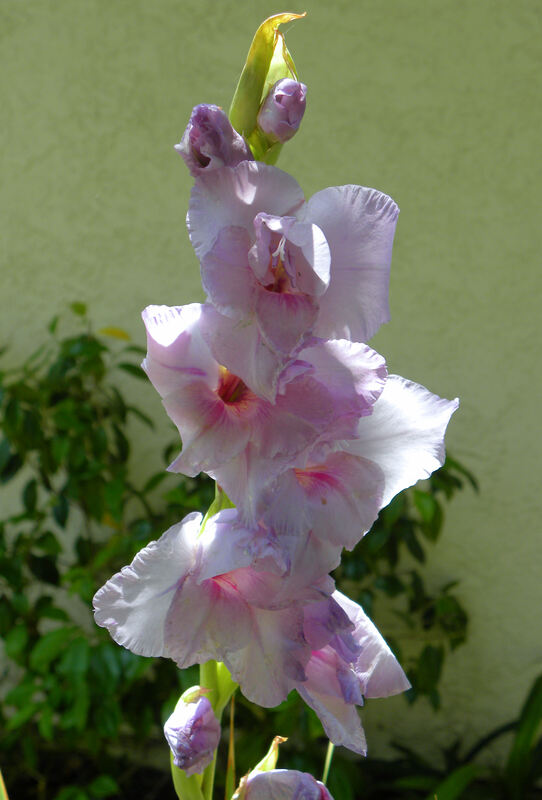 So is this lavender gladiolus. 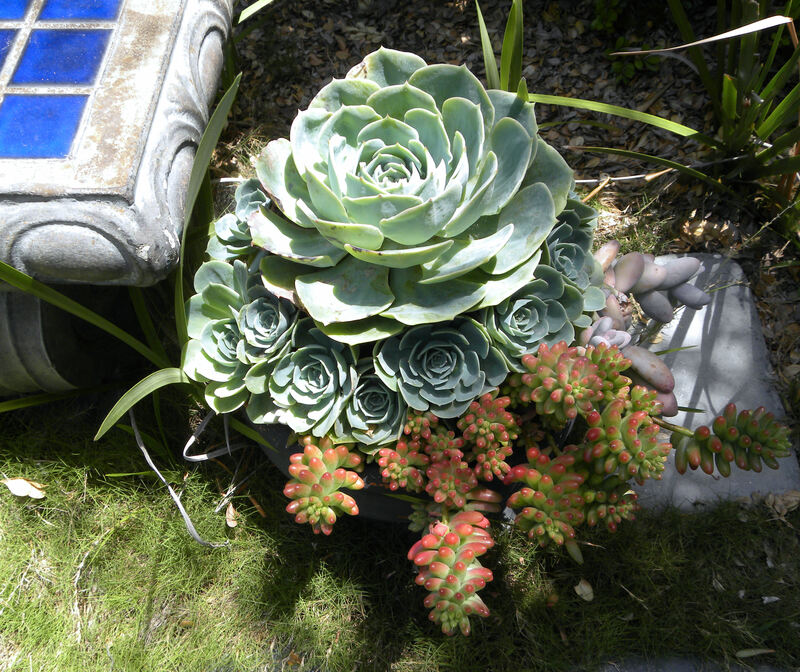 Pots of succulents make lovely drought-tolerant accent plants in our dry climate. 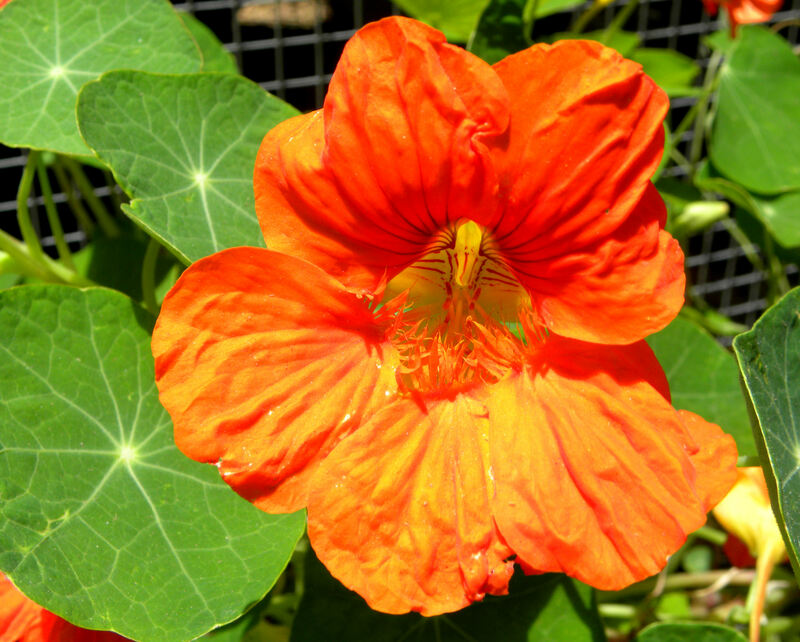 The backyard has been filled with nasturtiums since January. They've dropped a gazillion seeds, so I should have plenty more next year too. 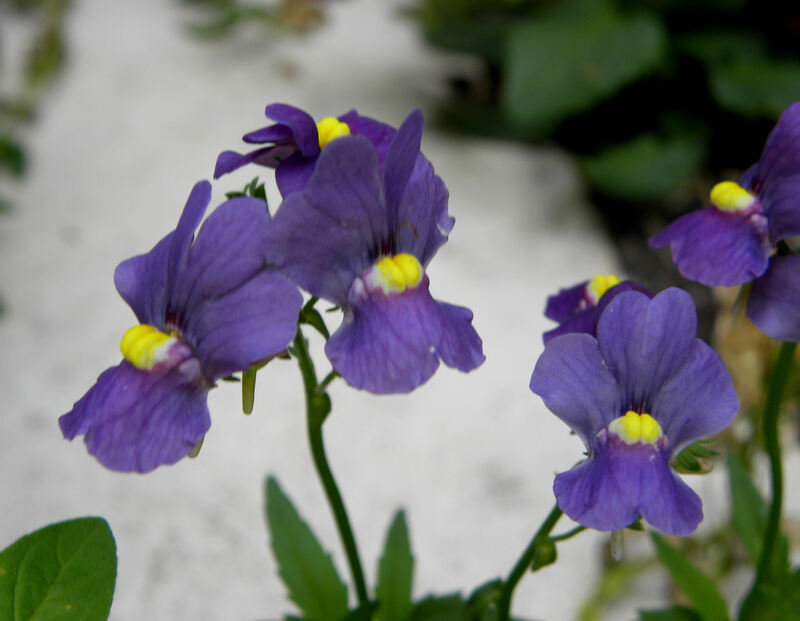 Nemesia is a lovely drought-tolerant flower that bloom all year round for me. Same with the allysum. 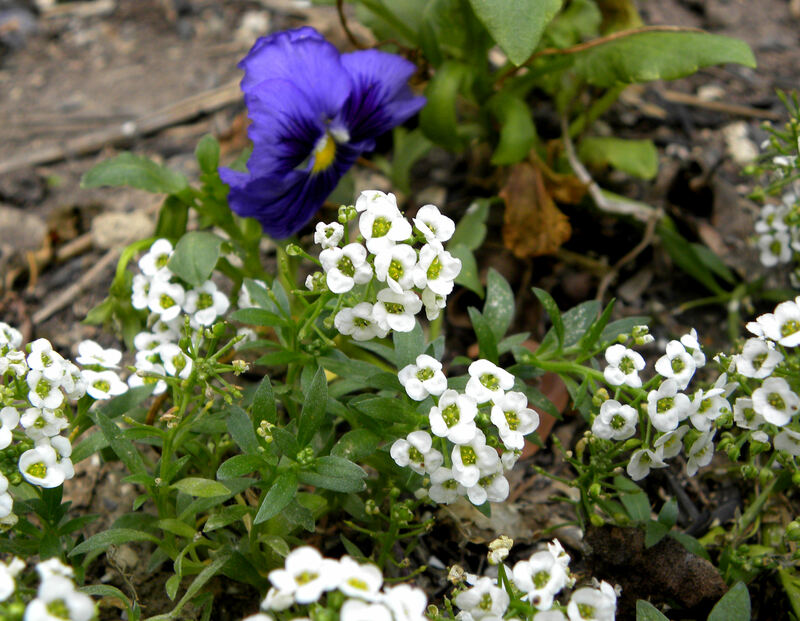 It attracts beneficial insects as well, but doesn't self-seed as readily as the Nemesia. 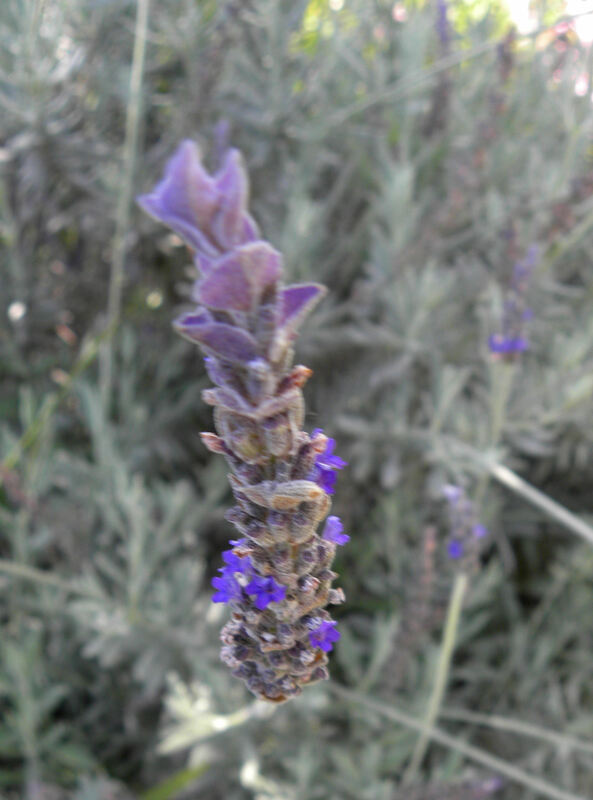 It's time to pick more lavender to make lavender sugar. I've nearly used up my first batch. 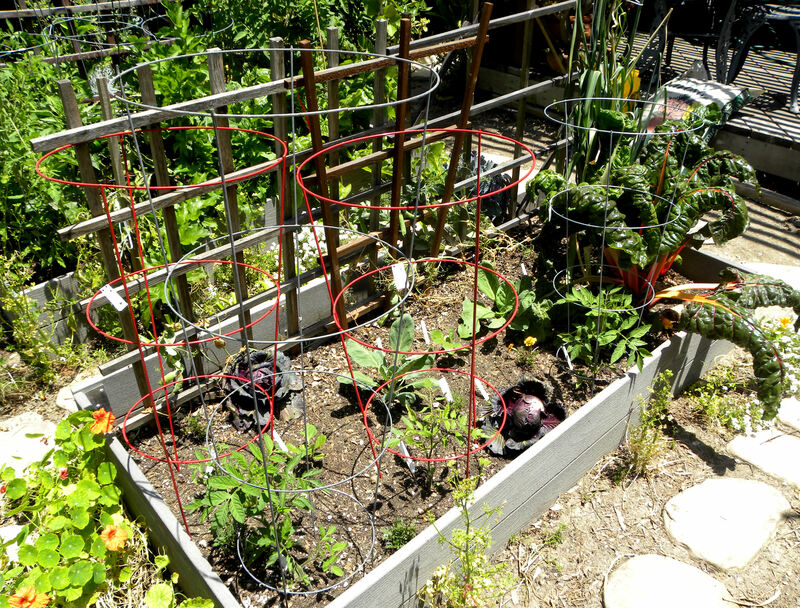 This entry was posted in Uncategorized and tagged backyard chickens, flowers, Fruit, hens, photos, vegetable garden, vegetables, video. Bookmark the permalink. As lovely as your photos are, they don’t do justice to the actual garden seen in person. Keep up the good work! Sigh. I remember living in Huntington Beach. I could plant my shoe and little baby shoe’s would grow. Everything looks spectacular, as always. Clare, nothing ventured, nothing gained. 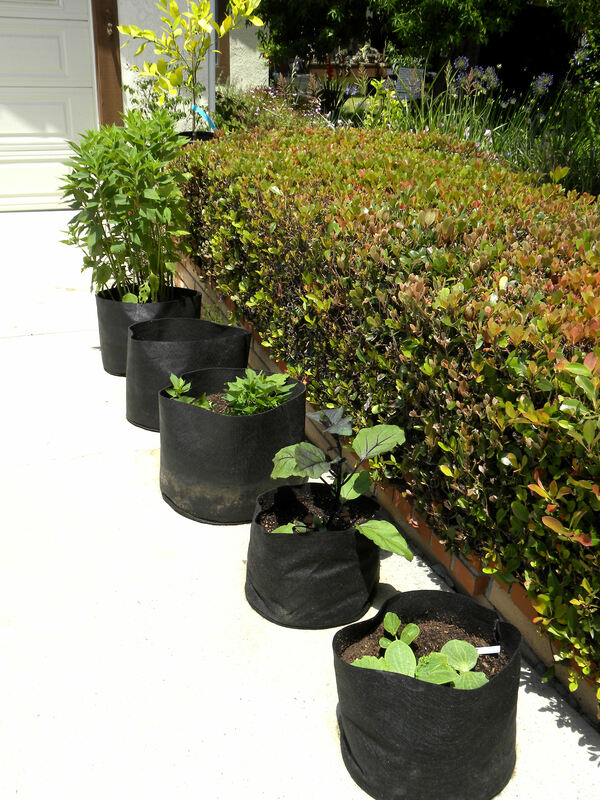 Plant that avocado! Just don’t plant one from seed. They seldom are good bearing trees. WOW! 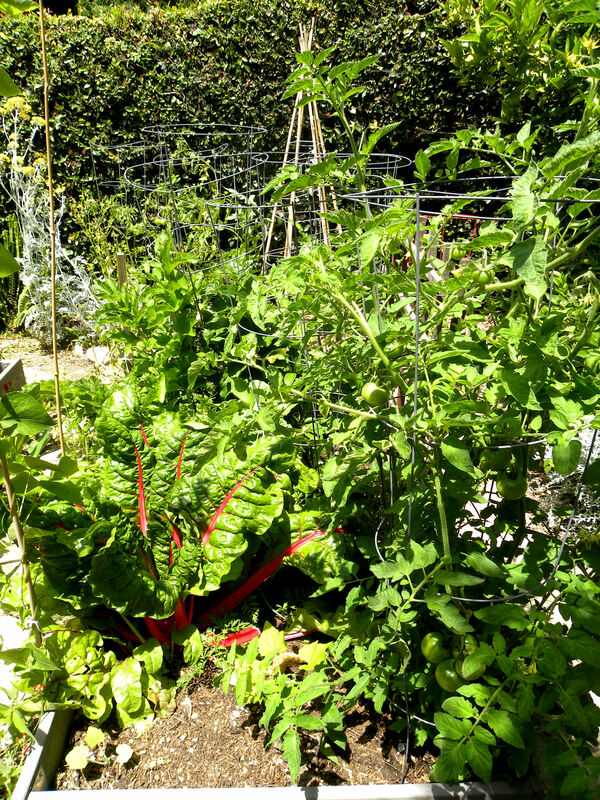 your garden is amazing, beautiful and edible. I am very envioues of those sunny skies. Love the blog, its a real window on another world! Hi Freerangegirl from Yorkshire. Thanks for stopping by. Yep, it’s another world down here in southern California. 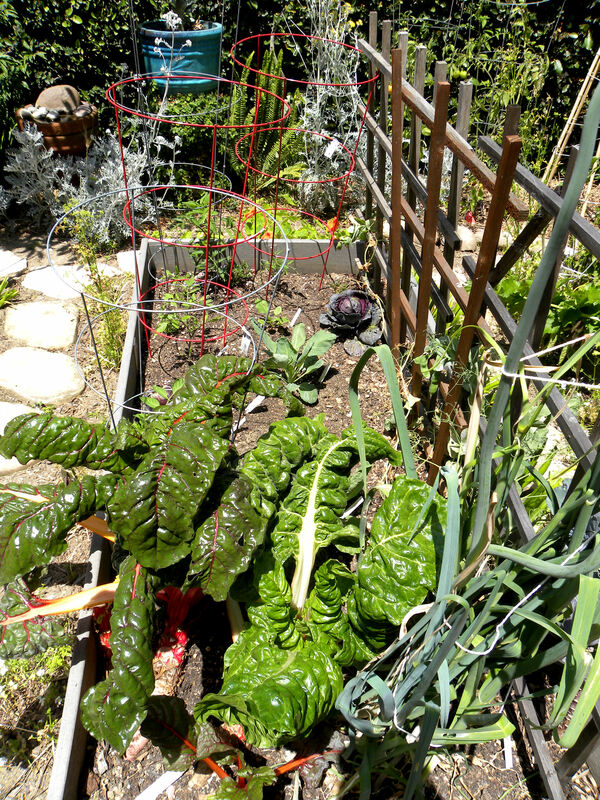 We have to (get to) garden all year long. Your garden is lovely and the hens adorable. I love lavender sugar, have you made rose sugar yet?, it’s just as yummy. No, Jane, I haven’t tried rose sugar, but now that you’ve suggested it I’ll give it a try. I got the idea for lavender sugar from your truffle party and I just love it.